A couple weeks ago, Google+ launched the Communities feature, and we quickly jumped on the opportunity to create a PhoneArena community as a way to give our readers a way to connect with us more directly. We've gotten some great feedback, and now we'd like to try out a first for us: a Google+ Hangout planned for Friday at 12PM EST. This is a first not just in getting some face-to-face time with our readers, but also in that some of us have never done a Hangout before, so it's expected to be pretty informal. As of now, we're expecting Michael H., and possibly John V. and Scott H. to join the fun from the PhoneArena team, so all we really need are readers to come join us. 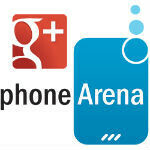 So, if you're interested, come join our PhoneArena Google+ Community, introduce yourself, and we'll see you there on Friday, December 21st at 12PM EST! Everyone with G+ can join and talk with you guys :D? That's right. Obviously there is a limit of 10 people per Hangout, so there may not be room for everyone, but usually people drop out and open up spots. We're hoping that people are respectful and come for a discussion and not a fight, of course. It would be hilarious yet sad if they start fighting in a hangout. Mike this is a very bad idea, remember the bias article, you will have a lot of Ifans, Fandroids, and windowsphans getting on and just arguing about how bias PA is towards one OS. It would be great to have a real discussions on hang out but I don't see it happening. Perhaps if you invite specific users that you know you can have an intelligent conversation with it would work out. never done a hangout. Well atleast i'll try something new. yay! But I've no idea how to convert to my time. Good to see Michael H. Would love to discuss some of his articles.